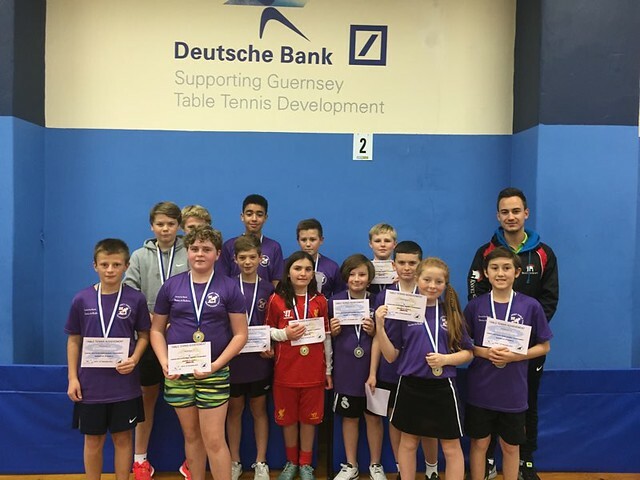 Another good weekend of table tennis at the Guernsey Table Tennis Centre saw 48 juniors take part in the fourth and final Deutsche Bank junior banded tournament of the season. Band 1 Luke Bichard took the title with Ben Foss taking runner up spot. Band 2 Ellis Tomlin came out on top despite a three way tie between himself, Callum Gilson and Alderney’s Marli Barker. They all winning 4 matches and lost 2. Tomlin had the best match ratio, Gilson was runner up having won his match against Marli narrowly 11-9 in the 3rd game. Band 3 Fast improving Alderney player Thomas Cosheril come out on top, second place went to Erin De Carteret on count back between herself and Caden Brouard. Band 4 The title in this Band was won by newcomer Sammy Tostevin. We went one better than last month, having come runner up. The Runner up spot went to Erin Vaudin. Band 5 Shelby Timms came out on top winning her first Deutsche Bank Junior banded Tournament. Not for the first time of the tournament yet again a countback was needed for the second place of which this time went to Jack Garbutt. Band 6 Saw the emergence of another new star, 8 year old Jaydan Tucknott. Winning all his matches and taking the title. The runner up spot went to Jaques Bideau. 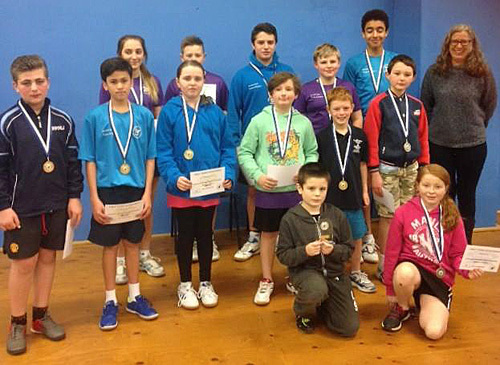 The next Junior tournament will be on Saturday 30th April (the Junior Deutsche Bank Bank Team Championships). 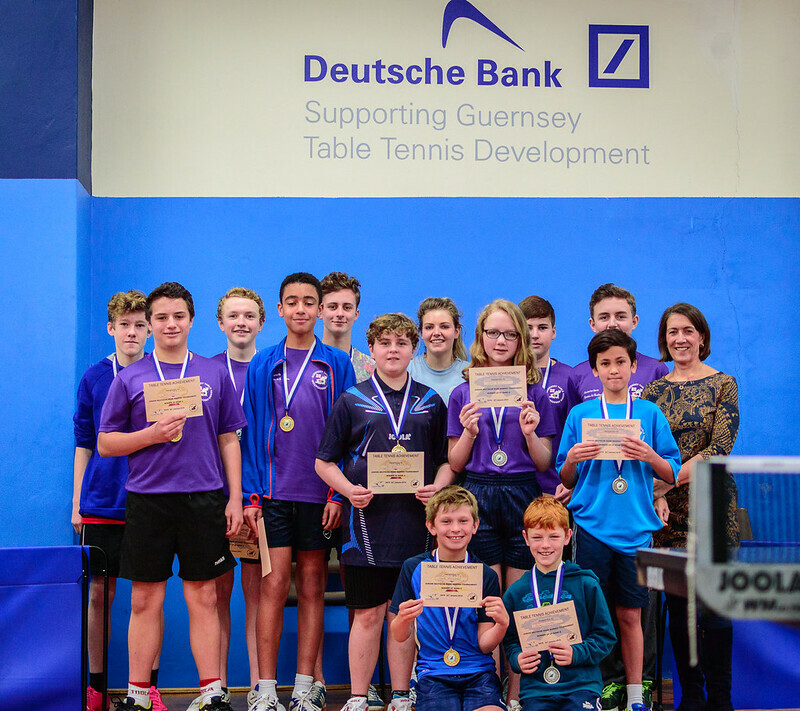 The table tennis Junior Deutsche Bank Banded tournaments got off to a great start last weekend at the table tennis centre. 52 juniors took part in the first of four Junior Deutsche Bank tournaments this season. 6 bands were made up of 8 or 9 players. In Band 1, Ben Foss took the title despite having lost to fifth place Luke Bichard. The runner up spot went to Joseph Bourgaize having finished joint second on points with Ryan Bichard. It came down to the result between the 2 players with Bourgaize narrowly beating Bichard 12–10 in the final game. In Band 2, Corey Brouard finished the event undefeated dropping only 2 ends during the days play. The runner up spot went to fast improving Billy Ogier. Band 3 saw another fast improving junior, Melissa Johns from Alderney, come out on top. Second place went to 10 year old Ben Sharp which again was decided by countback, both players lost one match but Johns had the better of Sharp 11–9 in the final game. The title in Band 4 went to Freddie Walker with some narrow hard fought wins over the other players in his band. Second place went on countback between three players, with Alderney’s Star O’Connor taking the honours. Erin Vaudin took the top place in Band 5. The tournament organiser decided the runner up spot with a 3 way tie between 3 players, young Ruari Cicmic took second place. Band 6 “The battle of the beginners” Hugo Everitt took top place and 8 year old Jayden Tucknott came runner up. The tournament had some exceptional matches during the course of the day with many of the matches going right to the wire in all 6 bands.